There were seven of us. There was supposed to be eight, but the last guy turned up fifteen minutes late. The woman running the tests said, basically, "the first test was punctuality, you failed, goodbye". A rectangle gets two green dots. A rectangle in a container gets two red dots. A star gets a red dot. A star in a container gets a green dot. everything else gets a blue dot. By 'container', some of the shapes were grouped in a larger border. You can see this in the example I made on the right. There were something like 28 sheets and we had half an hour. We had to work down in columns doing each as we came across it (you can't do all the blue dots, for example). Once I got into the rhythm, it seemed fairly easy - if a tad (!) on the frenetic side. I don't want to blow my trumpet, but I finished first. I'm a very visual person so this appealed to me. Of course, I could have totally cocked it up - I won't know the results until sometime later... if ever? Others? A pretty blonde that was maybe late teens to my left. She was quite quick too. To my right was an older woman, maybe late 30s early 40s who was not so quick. She had pages to go on this when time ran out. However she had a really nice disposition and was friendly. She came from Mayenne and given she said she spent some forty-odd minutes on her mobliette (a sort of moped-like thing), I think she probably meant the city, as Mayenne-the-département was a couple of minutes away! That's a hell of a commute! Across the table was an older bloke, late '40s? Let's say he found the whole affair less than straightforward. A youngish girl (late teens again) who was pretty in a sort of black-haired almost-scary way (think Neve Campbell in "The Craft" and you'll know what I mean), and her friend a blonde same age who wore a band around her head. Black-hair smoked, blonde fiddled with her mobile. There was another female but she made no impression on me I can't say anything. The second test was to do with quality control. We had to look for a 'design' across many pages. The design was digital, like a bar with two bits sticking upwards, and the end being a block halfway up, again as shown on the right. This design could be any colour, we had to whip through the pages and count how many times the design appeared on each page. It was like looking at a messed-up load of teletext graphics! The girl to my left was quick, she and I were keeping pace with each other. The poor older woman to my right didn't finish in time. I did notice that we all had different answers! Well, one of us has got the idea, and the rest are probably wrong! The third test was to look at diagrams of a pie and its label. We have to say if it is okay or not, by rejecting a pie that looks eaten, is missing bits, has the wrong colour on it, or has anything missing on its label. Blonde girl and I got pretty quickly into the habit of marking only the rejects, and then quickly filling in the passes before turning the page. I don't think the woman to my right did it like that, so again she ran out of time. A quick break so I used the toilet downstairs and had a good gander at a pretty impressive router. 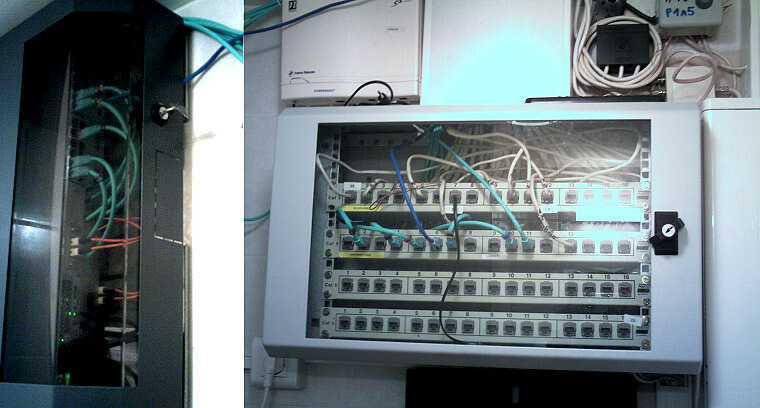 The toilet and the telephony/networking was all stuffed into a space under the stairs. They had an Orange Livebox, one of the exclusive black ones, the serious high-end types. This went into two different distribution racks, blinking lights and stuff all over. This setup must have served the mayor's offices as well as I can't believe the local office of the jobcentre with, like, three computers would need that kind of hardware! Yes, of course I took pictures! After break we went back to find we were arranged in two production areas. The first person had to pick up six soft balls, three of any colour and three of any other colour, and place them in a plastic tray. The second person had to pick up three soft balls of any other colour and one green marble. 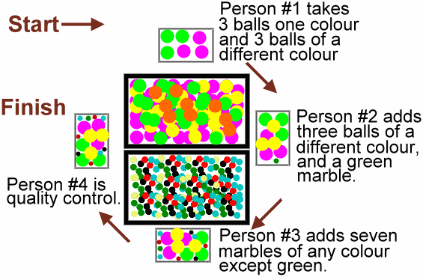 The third person had to add seven marbles of any colour except green. The fourth person - Contex - was the quality controller who had to check it all and mark OK or NOK as applicable. The diagram shows the exact same contents being added to the trays - this is purely so you can see the progression from one stage to the next. The only fixed requirement was #2 had to add a green marble, and #3 had to not add green marbles. And, the big balls needed to be 3×3 of different colours - but what colour balls and marbles were added was purely up to serendipity. We went around, took turns doing each. We did it in rotation for about an hour and a half, over and over. After a few mistakes all around we got the hang of it, and making/checking sixteen in four minutes was a breeze. My favourite position was post #2. Don't know why, I just liked it. I hated quality control. It takes three people to make a tray, and one to unmake it. Hectic. Oh, you might have picked up a discrepancy. Well thanks to late bloke being dismissed, our assessor filled in the fourth position. I hope she liked our efforts. To be honest, it was fun. Reminded me of junior school, only better. And that was it. I'll get a phone call, or maybe a letter, soonish for an interview... or not. Seems a lot of hassle to go through for a four-month contract, do they do this all the time? Why not employ people who will continue doing this?!? Anyway, who knows, maybe this time next month I'll be working in a 7-10°C environment putting cherries and raspberries on cakes? A mere quarter of a million a day. So no pressure then! Can't speak for group two, but they were always late compared to us (though, admittedly, some of that was waiting for older-bloke to get his act together). If I had to hire, I'd take our group. I don't think I was anything special whoo-hoo, but I got the job done as did pretty-blonde. Older woman, while slower on the first round of tests, performed well enough in our production line simulation. She might have had two plastic bolts to my twenty, but she didn't hold me up, we always made our quota of trays before the timer beeped, and I'd rate her personality too - she comes across as one of these people who will quietly get the job done. But, I'm not hiring. They are. I've done my bit. It's wait-and-see time. Their shifts are a bit hellish: 05h00 to 12h30 - 12h30 to 20h00 - 21h00 to 05h00. Might be able to do the morning, can do the day. Won't accept a night shift. In the winter that'll be mom driving both ways in the dark, in our old Renault 5. Not having that. We'll see. That's, of course, assuming I'm offered! So we're sitting in the car park of the Super U (think Sainsbury's) when the car shakes and there is a crunching noise. 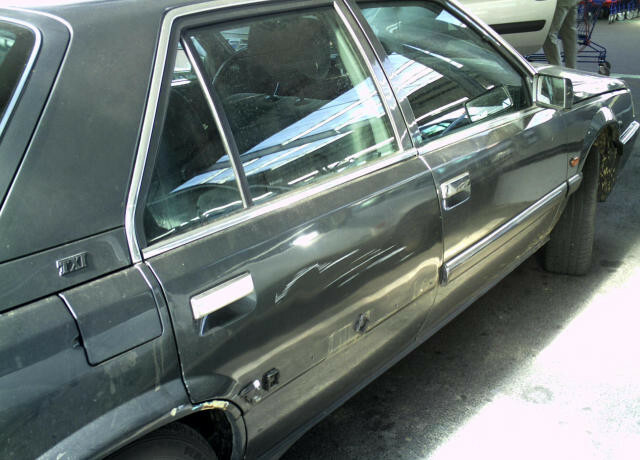 We look over to see some big-assed car swung in, missed, and hit us. Well, an overstatement, it was a long dark mark along the plastic panelling. So we get out and upon confronting the man, he says - in English - no, I did not hit you, it wasn't me before walking off. It should probably come as no surprise that it was a flippin' 75 registration (that's Paris, this guy was probably used to negotiating l'Arc de Triomphe!). So I tell mom we're going back to the shop to confront him. Mom's like "I'm not sure about that" so I tell her if he starts to make a scene, take my mobile, call 112, get the flippin' Gendarmes out. I'm not having some person say "wasn't me" and then walk off. Yup, he's looking directly at the camera. 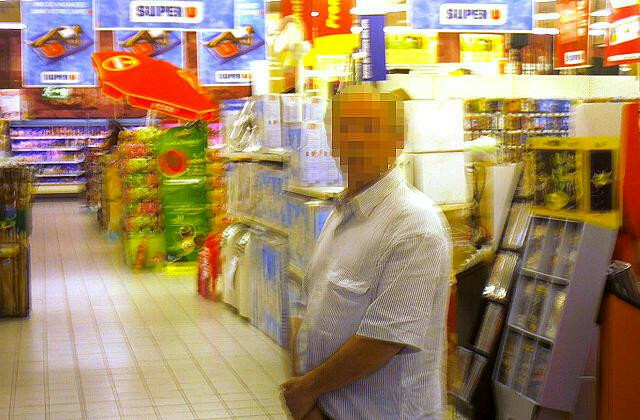 I've blurred/mosaic'd his face for obvious legal reasons. The jittering is because I took the picture without flash. So he comes towards me asking "is that a camera?" (no, it's a goldfish, duh!). So as he approached, I took another piccy or two - not to mention some of the car, licence plate, etc. The golden rule, photographic documentation, don't miss anything! At first he starts saying that it is unfortunate for us that he speaks our language, and he knows what we are up to as we tried the same thing with his wife a year ago. What?!? By now I've got my MP3 player out and pressed REC (and am about as subtle with that) while we try to point out to a flustered Parisien that what sort of arcane bad luck would it be for him to be in a position to hit the car of an English person who his wife may or may not have hit a year ago... I mean, you're on drugs right? This can only seem like a logical explanation to somebody on lala land (then I remember he is Parisien...). Eventually he backed down. Doesn't apologise, doesn't admit anything, but at least realises that his argument is so bogus it is almost comical. Let's face it. We have a dark mark on the side plastic panel of a 13 year old car. Nothing appears broken. Window goes up and down. Door looks in the right place. Nothing rattles. On the Richter scale of car crashes, this is a 0.1. It was his attitude that annoyed. At the point of backing down, you just get the feeling. That feeling that he knows that you know that he knows, and no words are necessary. Time to call an end and go home. Sadly, however, this has done nothing to aid my less-than-impressive view of Parisiens. I'd like to believe it is a city full of Amélies, but those few I have met have been varying degrees of pseudo-superior obnoxiousness. Anybody Frenchie reading this who happens to be a Parisien want to try to change my view? I just need one nice Parisien... offers? My email address is at the top of the document. Today's word is frenetic (freh-neh-tic); which means frantic, hectic, manic, wild; like trying to put the correct coloured dots into twenty eight pages of designs in half an hour!